Ramen noodles can be used for all types of dishes. I particularly like Ramen noodles because they have an alkaline component that gives the noodles more bite and mineral-ly taste. Upon putting together my favorite creamy alfredo sauce, I realized that I could also mix in some spinach pesto to make a creamy spinach ramen! It is for these reasons that always having both a pesto, and a cream sauce on hand in the fridge, is critical to living the goodlife! When you have them both available, this meal becomes a 10 minute meal and that can save you so much time in the day when you’re looking for a quick bite. I am fortunate to have a local asian grocery market, May Wah, that supplies me with a ton of different noodle options. Including ramen that has no eggs. If you can’t find this in a hood near you, then just throw in any kind of dried pasta option and this dish will still be amazing! For the protein components, I thought to use my beloved shiitake mushrooms, edamame, and corn. For the mushrooms, you’ll want to slice thin and give them a quick pan sear using minimal oil. Using a non-stick pan will get the job done the best for this. As for the edamame and corn, it’s easy to have frozen options on hand for meals like this. I just bring those up to temperature really quick, dunking them into the boiling water pot I have going for the ramen. We’ll season them with Japanese Shimichi pepper and set aside for our toppings. Once you have your cream sauce set and mixed on low heat, you’ll want to boil some ramen noodles for 2-3 minutes keeping them al dente. Using some tongs, just take the noodles right from the pot, to the sauce, bringing in some of that pasta water to help with the coating of the creamy spinach ramen sauce. The texture should be a little watery at this point and that’s okay because the noodles will thicken everything up, so keep the pan with the sauce on low heat and continually toss for about 2 minutes. Mix in your edamame and corn and kill the heat. At this point, prepare a plat of fresh spinach and as a nice side to the dish, I like to use fresh kimchi to bite through all the richness of the cream while adding a little salty kick too! Nothing like a good fermented kimchi! Then top the noodles with your seared mushrooms, some chopped green onions, and shredded seaweed for the final toppings! Hopefully, you’ll enjoy the savoriness of this ramen dish. And again, if you’ve made all the sauces in advance, this one is something you can add to your weekly menu for an easy 10-15 minute meal! A creamy spinach sauce that will coat ramen noodles perfectly! 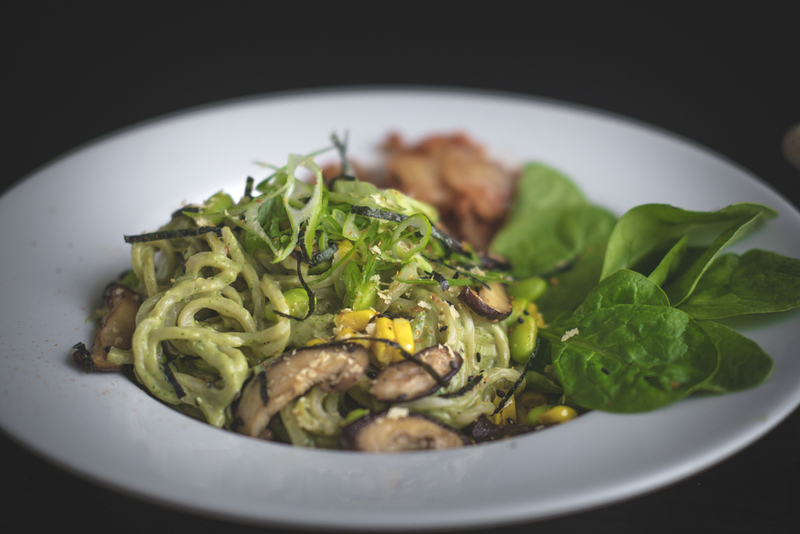 Topped with fresh shiitake mushrooms, corn, and edamame. 2 cup cream sauce Recipe link in write-up above! 1/4 cup spinach pesto Recipe link in write-up above! Ready a pot of boiling water for ramen noodles. Add in 1/2 tbsp of salt for the ramen water. While waiting for water to boil, slice shiitake mushrooms and green onions for garnish. In a non stick frying pan, dry sear fresh sliced shiitake mushrooms until golden brown. Season with a pinch of salt and set aside in small bowl. Prepare sauce by heating a sauce pan over low heat. Add 2 cups of cream sauce and 1/4 cup of pesto sauce together. Mix to evenly combine sauces. When sauce is warmed, you can turn off heat. Be careful not to burn sauce. Place corn and edamame in a mesh strainer and dunk into boiling water for about 30 seconds. Strain and place into a small bowl to season with Japanese Shichimi Pepper. Cook Ramen noodles for 2-3 minutes until al dente. Using tongs, grab pasta and throw directly into sauce pan to mix. Sauce should be able to absorb some ramen liquid and still be warm. Use a low heat to help sauce absorb into ramen noodles. If sauce is too dense, scoop in 2 tbsp of noodle water to loosen everything up. Continue to mix and stir pasta for 2 minutes and add in corn and edamame. Turn off heat at this point and prepare serving plate with fresh leaves of spinach and side of kimchi. Plate the ramen noodles and add shiitake mushrooms. Garnish with green onions and shredded nori seaweed. Enjoy!